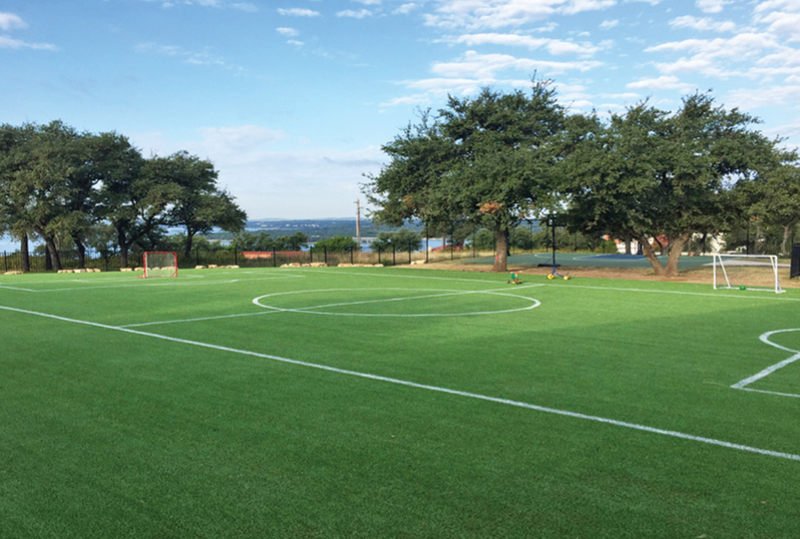 The new Kickabout field at International School of Texas, Austin, TX. 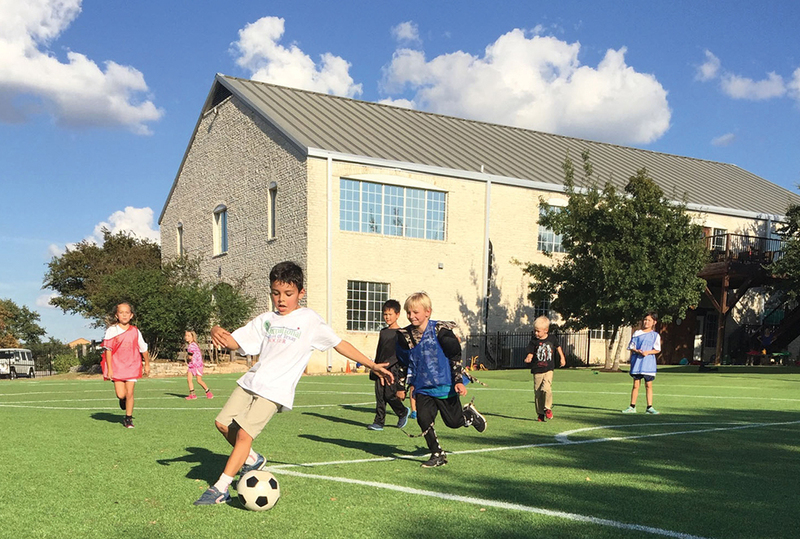 The International School of Texas (IST) in Austin will host their Grand Opening on Thursday, Nov. 17, at 10 a.m., for their new, environmentally friendly Kickabout™ field. This new sports and playground concept is built by Hellas Construction, Inc., a nationwide sports construction company also located in Austin, TX. “This field is taking our physical education and soccer leagues to a new level,” said Tim Reilly, Head of School at IST. “We were starting team sports and wanted a top of the line facility for our students,” he said. “We looked at everyone out there. We wanted the best of the best, which is why we chose Hellas,” said Reilly. The Hellas Kickabout project at IST is built with top-grade recyclable turf and a shock pad, organic infill, a nailer board made of recycled P.E.T. materials (plastic bottles), and a foundation of locally sourced stone. The Kickabout play surface is also utilizing the existing rainwater collection system to irrigate the organic infill. The project was completed in two weeks. “We absolutely love it,” Reilly said. “The soccer team uses the field everyday. All the kids are benefiting from the field,” he said. They have also noticed a decline in injuries. “It’s extremely safe,” Reilly said. “Inevitably, children will fall. When they do, they just pop right back up and keep going,” he said. “Any school, in any setting, would benefit from a Kickabout,” said Reilly. Kickabout is an innovative, customizable play surface that allows children to play a wide variety of sports in any weather, without the worry of potholes, mud, tall grass, or weeds. Hellas uses their exclusive Matrix® synthetic turf or Grasso® synthetic turf, a simple drainage system, and either organic infill or pea gravel infill to make this all-in-one, fun-packed play surface. Kickabout excites children and drives them to play and be active everyday, by providing a safe reliable place for games, sports, and activities. Construction and installation can take as little as one week depending on size and complexity. Kickabout is customizable from 2,000 to 20,000 sq. ft., and made to fit into any existing space. Sports or games like soccer, funnel ball, hopscotch, tetherball, or four square can be added or combined to make one fun-packed playground. This low maintenance, environmentally friendly surface uses little or no water and additional shock pads may also be added for extra safety in areas under existing playground equipment or anywhere extra padding is requested. The Kickabout play surface offers a new generation of playground and sports surfacing for the next generation of pre-k and elementary students. Kids at the International School of Texas playing soccer on their new Kickabout field.